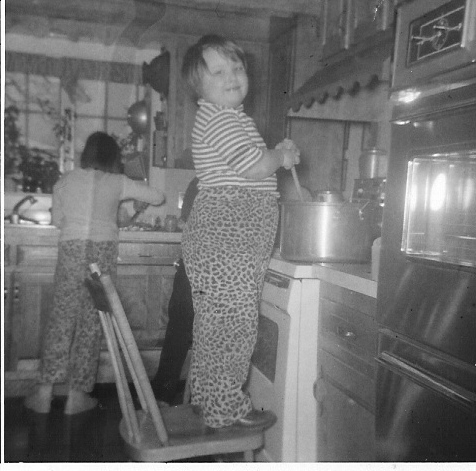 and a really bad childhood picture of me doing what I do for a living now, cook, but without the chair….Oh! And the fancy pants! My mom made some of my clothes, and believe it of not, there was a matching vest to match. UGGGG! What was she thinking letting me wear stripes at the same time! In 1970 wild fabric prints were groovatious, i guess. You can tell by my shape that I loved food and cooking. Mom used to say, "Kid, you were born hungry!" My family worked together in the kitchen for the most part. In the background you can see my sister in, her fancy pants, washing dishes. I'm blocking your view of my brother drying the dishes. It must have been before he developed the syndrome we called "dish pan diarrhea". Defined as: having to go to the bathroom EXACTLY when it's time to do the dishes! You are invited to visit my website at www.isimmer.com for more of my recipes and stories. This entry was posted in Uncategorized and tagged a glimpse of where it all started, chef, isimmer, susan j beach. Bookmark the permalink.